"﻿﻿﻿EU Trade Strategy: The EU-US TTIP, and the EU-China BIT", International Compliance Professionals Association﻿ Europe Conference, Brussels, Belgium. 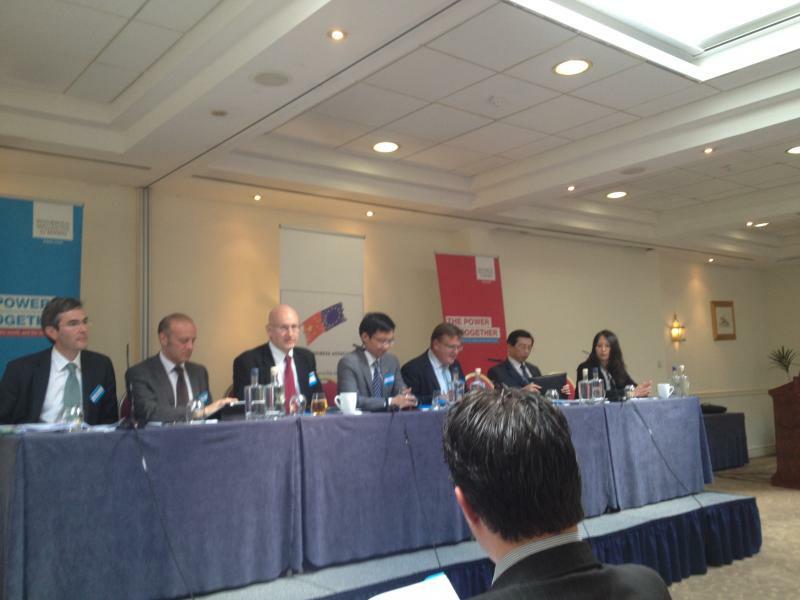 "The EU-China Bilateral Investment Agreement", ﻿EU-China Business Association, The Future of EU/China Trade and Investment Relations﻿, Brussels, Belgium. "What Is a Robust Internal Import Compliance Program for China Operations: Huawei Experience", 3rd Advanced China Forum on Import Compliance, American Conference Institute, Shanghai, China﻿﻿. 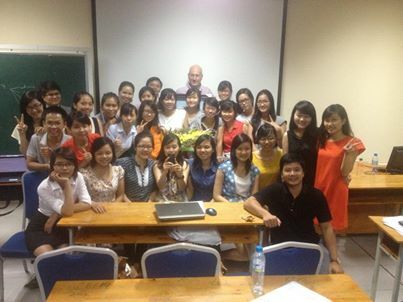 "WTO Trade Remedies", ﻿Foreign Trade University of Vietnam, Hanoi, Vietnam﻿. 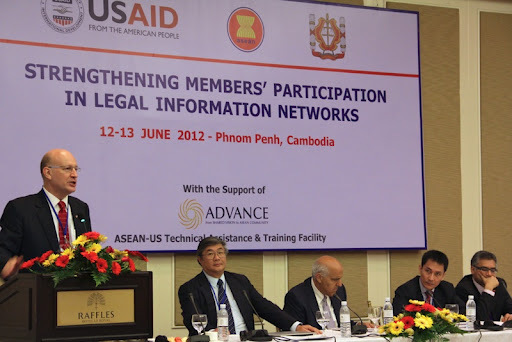 “Enforcement of Judgments and Arbitral Awards: Trends and Implications in ASEAN”, ASEAN Judicial Conference on Strengthening Members Participation in Legal Information Networks, USAID-Sponsored, Phnom Penh, Cambodia. “Trade and Development: WTO Rules and Trends, and the ASEAN Development Example”, ELSA Asia Pacific WTO Moot Court Academic Conference, Jakarta (Tangerang), Indonesia. “Rules on Subsidies and Countervailing Duties – WTO and U.S. Law Perspectives”, Ministry of Justice Seminar, Hanoi, Danang and Dalat, Vietnam. “International Investment Arbitration – Rules and Practice”, Ministry of Justice Seminar, Hanoi, Danang and Dalat, Vietnam. “Different Approaches to Drafting FTA Texts”, MUTRAP Seminar on FTA Negotiation, Ministry of Trade of Vietnam, Hanoi, Vietnam. “WTO Rules On Anti-Dumping Investigation Procedures”, Private Sector Seminar, Vietnam Competition Authority, Ministry of Trade, Hanoi and HCMC, Vietnam. “WTO Trade Remedies Laws and Practice: WTO Rules on Subsidies and Safeguards”, Private Sector Seminar, Vietnam Competition Authority, Ministry of Trade, Hanoi and HCMC, Vietnam. “WTO Trade Remedies Laws and Practice: WTO Rules on Anti-dumping”, Private Sector Seminar, Vietnam Competition Authority, Ministry of Trade, Hanoi and HCMC, Vietnam. “ASEAN and FTAs: Implications For Business”, Vietnam Supply Chain Seminar, HCMC, Vietnam. “Distribution Hurdles: Lessons Learnt from Recent Cases”, Professional Development Seminar, Hue, Vietnam. “Success for Vietnam in the U.S. Catfish AD Case -- Lessons for Enterprises”, Vietnam Competition Administration Seminar, Ministry of Trade, Hanoi, Vietnam. "Civil Law Interpretation", Vietnam Baseline Legal Training, HCMC, Vietnam. "WTO Dispute Settlement”, Ho Chi Minh City WTO Center Seminar, HCMC, Vietnam. "The Trans-Pacific Partnership: 21st Century FTA?”, Ho Chi Minh City WTO Center Seminar, HCMC, Vietnam. Subsidies/Countervailing Duties”, Ho Chi Minh City WTO Center Seminar, HCMC, Vietnam. "The Trans-Pacific Partnership: 21st Century FTA? ", Academic Conference, The EMC2 Asia-Pacific WTO Regional Round Academic Conference, Taipei, Taiwan. “International Trade Developments and Audits, Investigations and Prior Disclosures Around the World - Antidumping/CVD Developments: Asia and the Americas”, Baker & McKenzie Global Webinar. Exploitation of Oil and Gas, Mineral and Geothermal Resources: Review of PSC Experience in Vietnam", AMPLA/IBA SEERIL Resources and Energy Law Conference, Singapore. “Beyond Compliance - The Secure Transfer of Goods and Technologies Across Borders: Customs Procedures, Export Controls and Trade Security Initiatives”, Asia Pacific Trade and Commerce Conference, Singapore. “Opportunities Under Public Procurement Rules And The GATT Government Procurement Agreement”, Asia Pacific Baker & McKenzie Client Forum, Singapore. “Customs Issues in Asia Pacific Region - Customs Procedures and FTAs”, Asia Pacific Baker & McKenzie Client Forum, Singapore. “Import and Export Documentation: Legal and Practical Issues”, Vietnam Customs Duty 2010: Planning and Problem-Solving, Irving Seminars, HCMC, Vietnam. “Trading and Investing in Vietnam: Legal Aspects”, Young Presidents Association Seminar, Hanoi, Vietnam. “Tax ABCs of Supply Chain Planning: Customs Duties & FTAs”, Baker & McKenzie Asia Pacific Tax Conference, Shanghai, China. “ASEAN Economic Community: Implications For Business”, Singapore Business Group Seminar, HCMC, Vietnam. “Work Permits and Business Visas – Time for Enforcement? -- What The Rules Mean For Businesses, and How Immigration Is Now Helping To Enforce”, Seminar at AmCham Annual Meeting and Dinner, Hanoi, Vietnam. “WTO Trade Remedy Rules: How to Successfully Avoid or Respond to an Overseas AD Case?”, Baker & McKenzie Client Seminar, Bangkok, Thailand. 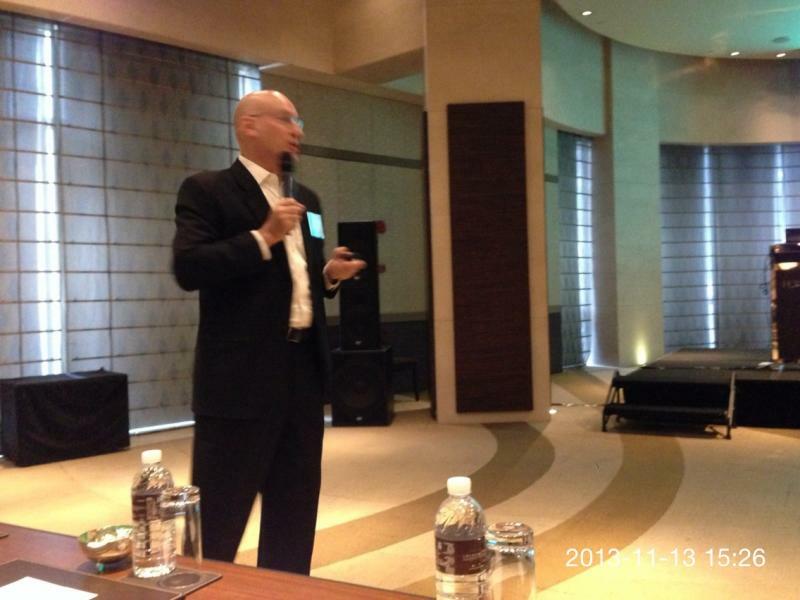 “South-East Asia Regional Integration: ASEAN”, Baker & McKenzie Client Seminar, Bangkok, Thailand. “The WTO: Main Principles and Benefits of WTO Law”, Baker & McKenzie Client Seminar, Bangkok, Thailand. “Investing In Power Generation: Key Vietnam Issues”, Baker & McKenzie Client Seminar, Bangkok, Thailand. “The ABCs of ASEAN and FTAs”, Baker & McKenzie Regulatory & Commercial/Compliance Baseline Training, Hanoi, Vietnam. “WTO Trade Remedies”, Regional Trade Remedies Training Course, DAI, HCMC, Vietnam. “Tax & Customs Optimization Through Commercial Agreements”, Asia-Pacific Indirect Tax and Trade Conference, Singapore. “Free Trade Is Not Free”, Asia-Pacific Indirect Tax and Trade Conference, Singapore. “Trade Remedies”, Asia-Pacific Indirect Tax and Trade Conference, Singapore. “Imports/Exports Regional Updates - Vietnam”, Asia-Pacific Indirect Tax and Trade Conference, Singapore. “Introduction To Petroleum Production Sharing Contracts (“PSC”) In Vietnam”, Professional Development Seminar, Nha Trang, Vietnam. “Update on Trade Remedy Developments in China”, China Supply Chain Briefing, Beijing, China. “Investing In Power Generation: Key Vietnam Issues”, Baker & McKenzie Client Seminar, HCMC, Vietnam. “U.S. Law and Practice on Preparation of Anti-Dumping Petitions”, MUTRAP Seminar, Hanoi and HCMC, Vietnam. “WTO Anti-Dumping Law and Practice”, Vietnam Competition Administration Seminar, Ministry of Trade, Halong, Vietnam. “Non-Market Economy Issue: Laws and Practice of WTO, US and EC”, Vietnam Competition Administration Seminar, Ministry of Trade, Halong, Vietnam. "Legal Perspective: Managing Offshore Risk and Establishing Partnership Contracts”, Vietnam Offshore Oil and Gas Conference, Hanoi, Vietnam. "Coping With NME Status -- US Laws and Regulations on Investigations Involving Non-Market Economies", Vietnam Competition Administration Seminar, Ministry of Trade, HCMC and Hanoi, Vietnam. “Antidumping and Countervailing Duties: Trends and Enforcement Issues in US, Canada and Asia/Pacific”, Baker & McKenzie Global Webinar. "Identifying and Responding To Foreign Anti-Dumping Cases”, China Supply Chain Seminar, Hong Kong. “What Do Foreign Investors Really Want to Know?”, Economic Diplomacy Workshop, STAR Vietnam Seminar, Vinh Phuc, Vietnam. “Free Trade Agreements: WTO Rules, and The Typical FTA Scope”, International Trade, Customs and Compliance Training, Asia-Pacific, Hanoi, Vietnam. “Investing in Vietnam’s Petrochemical Sector”, Asia Pacific Trade and Commerce Seminar, Sydney, Australia. “WTO Safeguards Agreement: Law and Practice”, International Trade, Customs and Compliance Training, Asia-Pacific, Hanoi, Vietnam. "WTO Trade Remedies: Laws and Practice on Subsidies and Countervailing Duties", International Trade, Customs and Compliance Training, Asia-Pacific, Hanoi, Vietnam. "WTO and US Rules on Trade Remedies: Case Studies involving the Vietnam Plastic and Footwear Cases", Vietnam Competition Administration Seminar, Ministry of Trade, HCMC, Vietnam. "WTO Dispute Settlement", Ho Chi Minh Academy, Hanoi, Vietnam. "WTO Rules on Trade Remedies: Antidumping, Subsidies/Countervailing Duty, and Safeguards", Ho Chi Minh Academy, Hanoi, Vietnam. 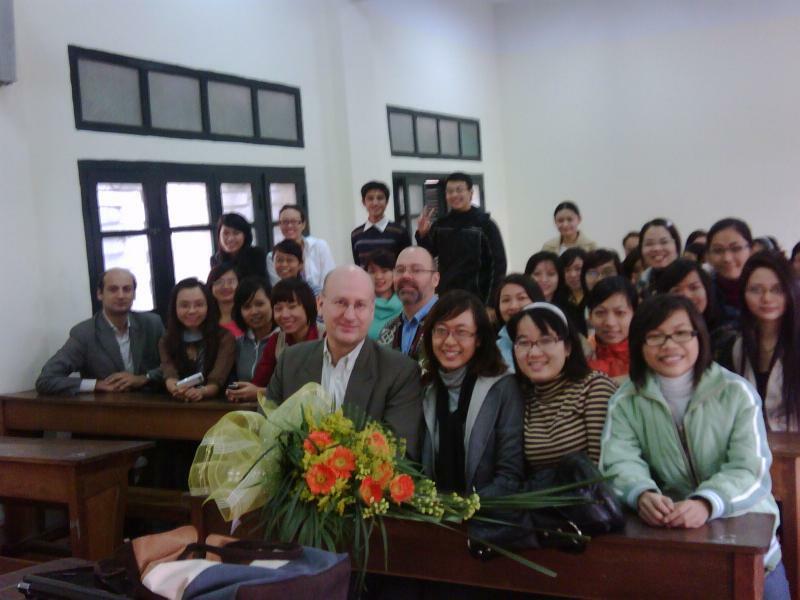 "Introduction to WTO Law and the Principles of Non-Discrimination", Ho Chi Minh Academy, Hanoi, Vietnam. "WTO Trade Remedies: Anti-Dumping Laws and Practice", International Trade, Customs and Compliance Training, Asia-Pacific, Hanoi, Vietnam. “WTO Trade Remedies: Anti-Dumping Laws and Practice”, 25th Annual Asia Pacific Tax Conference, Singapore. “Topical Trade Issues”, 25th Annual Asia Pacific Tax Conference, Singapore. “WTO Dispute Settlement Law and Practice”, DAV WTO Law course, Diplomatic Academy of Vietnam, Hanoi, Vietnam. “Legal Perspective: Risk Management & Status of Overlapping Sovereign Claims”, 12th Vietnam Oil, Gas and Power Conference, HCMC, Vietnam. “WTO Trade Remedies Laws and Practice”, DAV WTO Law course, Diplomatic Academy of Vietnam, Hanoi, Vietnam. “Sourcing in Vietnam and ASEAN: Strategies to Unlock Savings”, Global Sourcing Conference 2009, HCMC, Vietnam. “Growth of Customs Disputes in Vietnam, Trends of Criminalization, and Common Disputes Issues”, KPMG Client Seminars, HCMC and Hanoi, Vietnam. “Using ASEAN and WTO/WCO Arguments For Defending Vietnam Customs Cases”, KPMG Client Seminars, HCMC and Hanoi, Vietnam. “Origin Rules In Customs Planning”, KPMG Client Seminars, HCMC and Hanoi, Vietnam. “Work Permits – Time for Enforcement?”, Seminar for the American Chamber of Commerce Annual Meeting, Hanoi, Vietnam. "US Anti-dumping Law and Practice", Vietnam Competition Administration Seminar, HCMC, Vietnam. “Customs Valuation: The Main Principles of Customs Valuation and Case Studies”, Asia Pacific VAT/GST Conference, Hong Kong. "WTO and US Rules on Trade Remedies", USAID seminar for the Ministry of Justice, Cua Lo, Vinh, Vietnam. "ASEAN Update", Baker & McKenzie Annual Trade and Customs Conference, London, England. “Introduction To the ASEAN Economic Community”, Professional Development Seminar, HCMC, Vietnam. "WTO Agriculture and SPS Agreements: Examples of Practical Applications", Ho Chi Minh Academy, Danang, Vietnam. 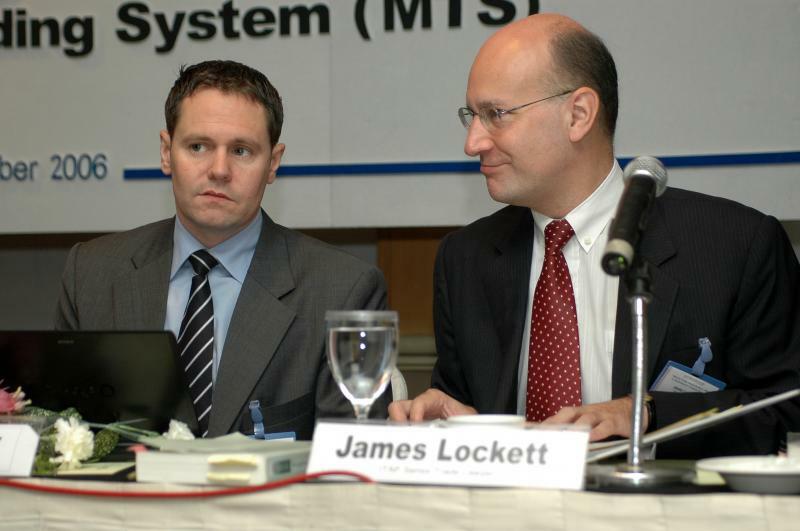 "WTO Dispute Settlement", Ho Chi Minh Academy, Danang, Vietnam. 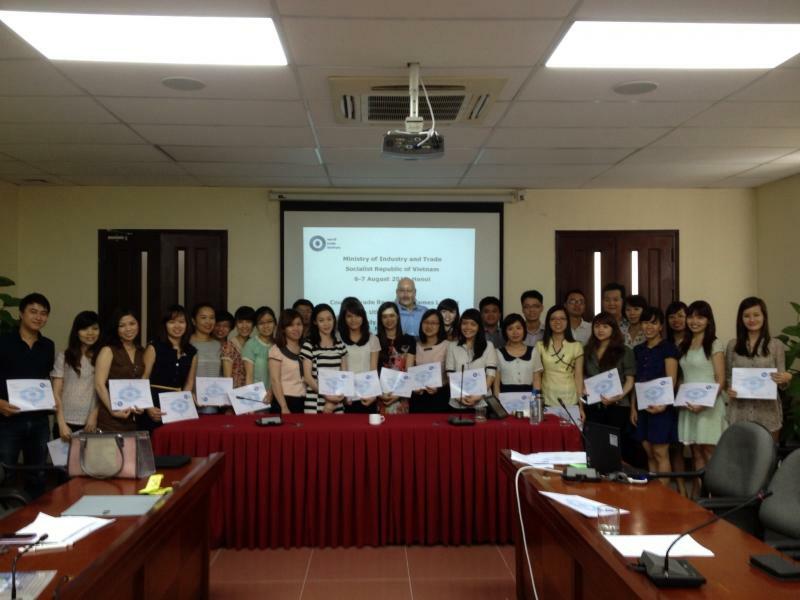 "Introduction to WTO Law and the Principles of Non-Discrimination", Ho Chi Minh Academy, Danang, Vietnam. "WTO Rules on Trade Remedies: Antidumping, Subsidies/Countervailing Duty, and Safeguards", Ho Chi Minh Academy, HCMC, Vietnam. "South-East Asia Regional Integration: ASEAN", Ho Chi Minh Academy, HCMC, Vietnam. "Global Trade: A Primer on Vietnam and ASEAN Customs Laws", International Compliance Professionals Association, Anaheim, California, USA. "How to Remain Compliant with the Customs Laws with Limited Resources", Baker & McKenzie Global Client Webinar. "Managing the Employment Relationship in a Downturn: Key Legal Issues And Negotiation Strategies", AmCham, HCMC, Vietnam. "Strategies for Managing the Employment Relationship in a Downturn", AmCham, Hanoi, Vietnam. 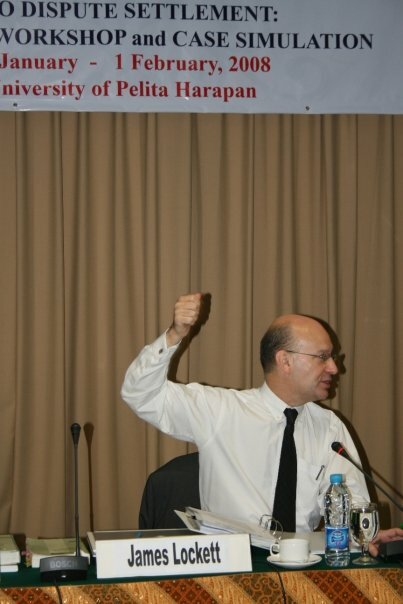 “WTO Dispute Settlement", Diplomatic Academy of Vietnam, Hanoi, Vietnam. "WTO Trade In Services", Ho Chi Minh Academy, Hanoi, Vietnam. 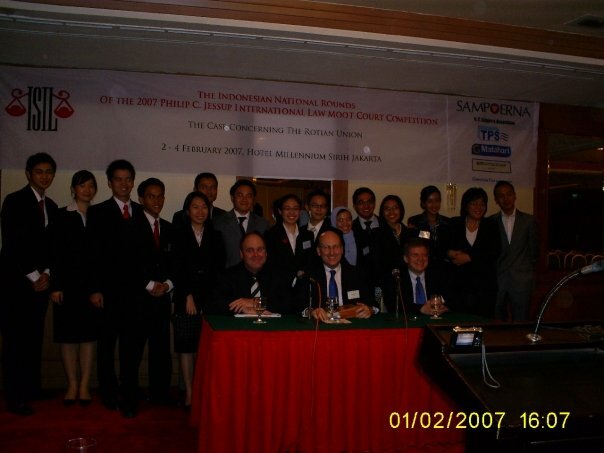 “Hidden Tax Costs in Supply Chain Structures”, 2008 Asia Pacific Tax Conference, Kuala Lumpur, Malaysia. “Sourcing in Vietnam: Issues and Strategies”, Asian Strategic Procurement Forum, Singapore. “Import and Export Documentation: Legal and Practical Issues”, Vietnam Customs Seminar, Irving Seminars, HCMC, Vietnam. 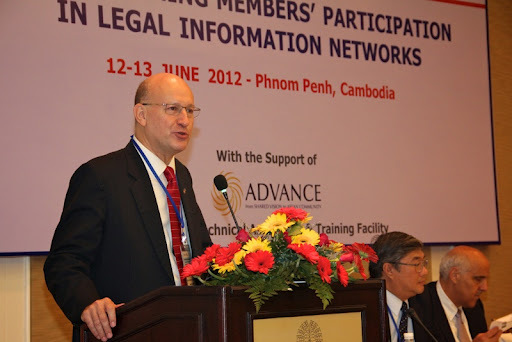 “Current Trends in International Trade Law”, Practice Development Seminar, Nha Trang, Vietnam. “Advanced Workshop on WTO Dispute Settlement”, University Pelita Harapan, Karawaci, Indonesia. “Comparison of US and EC Commercial Law and Regulations” Ministry of Trade Legal Seminar, Jakarta, Indonesia. “Advanced Symposium on WTO Law”,University of Indonesia, Depok, Indonesia. “International Trade Negotiations - The Role of Lawyers”, Ministry of Agriculture Legal Seminar, Bogor, Indonesia. “WTO Services Agreement: Legal Seminar and Policy Roundtable”, USAID Legal Seminar Series, Jakarta, Indonesia. “WTO Antidumping Law and Practice - Impact for Indonesia”, USAID Legal Seminar Series, Jakarta, Indonesia. “Practical Legal Issues in Antidumping, Subsidy and Safeguard Proceedings”, USAID Legal Seminar Series, Jakarta, Indonesia. “WTO Agreement on Agriculture: Legal Seminar and Policy Roundtable”, USAID Legal Seminar Series, Jakarta, Indonesia. “WTO Agreement on Import Licensing Procedures”, Ministry of Trade Legal Seminar, Jakarta, Indonesia. 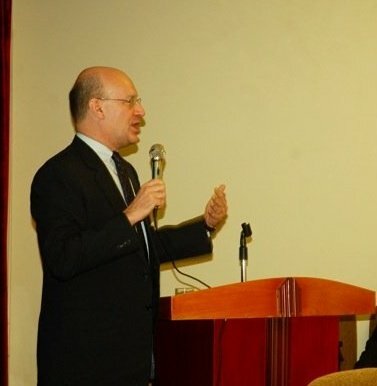 “WTO Law: Basic WTO Legal Principles”, Lecture for LL.M. Program, University of Indonesia, Jakarta, Indonesia. “WTO Notifications For Import Licensing”, Ministry of Trade Legal Seminar, Jakarta, Indonesia. “Regional Trade Agreements under the WTO”, Ministry of Trade Legal Seminar, Jakarta, Indonesia. “Notification Requirements Under WTO Agreements”, Ministry of Trade Legal Seminar, Jakarta, Indonesia. 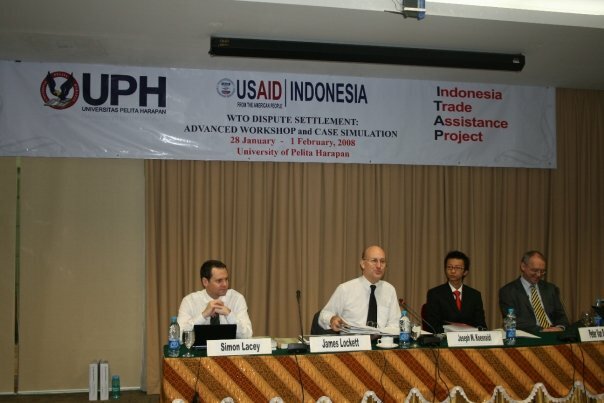 “WTO TRIPS Agreement”, USAID Legal Seminar Series, Jakarta, Indonesia. 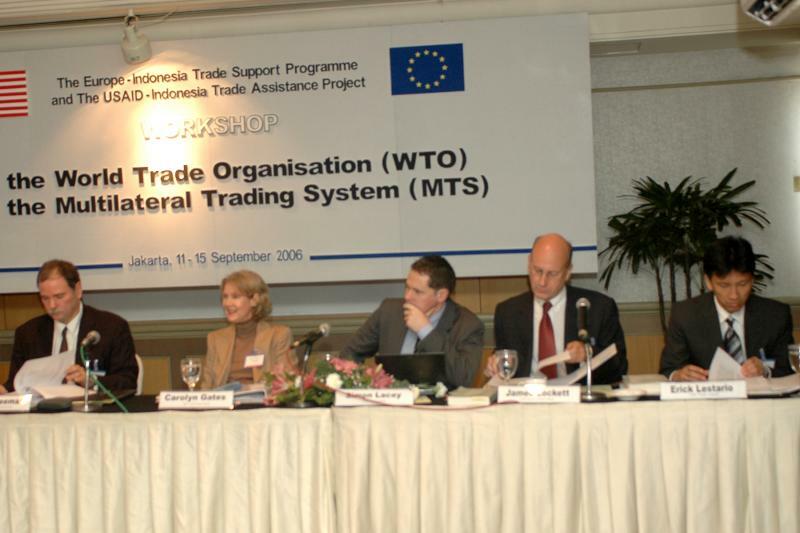 “WTO Dispute Settlement”, Joint EU/USAID Conference on the Multilateral Trading System, Jakarta, Indonesia. 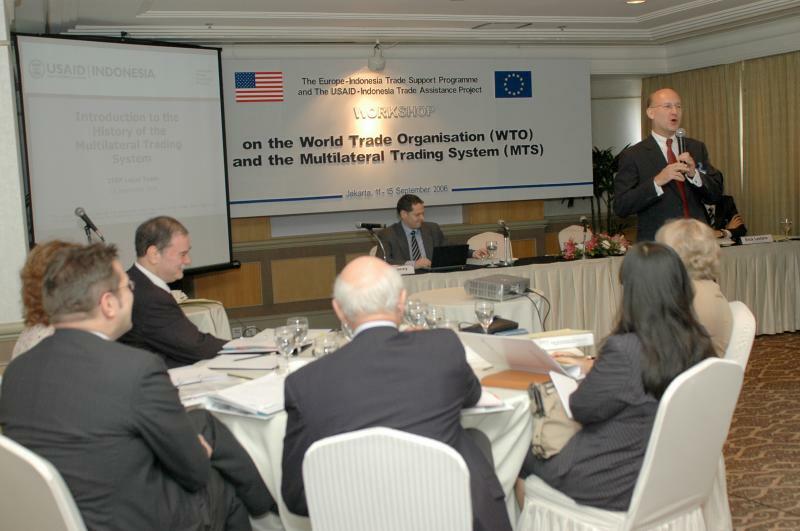 “WTO Law: Agreements and Institutions”, Joint EU/USAID Conference on the Multilateral Trading System, Jakarta, Indonesia. “WTO Law on Safeguard Measures”, USAID Legal Seminar Series, Jakarta, Indonesia. “WTO Agreement on Subsidies and Countervailing Measures - Law and Practice”, USAID Legal Seminar Series, Jakarta, Indonesia. 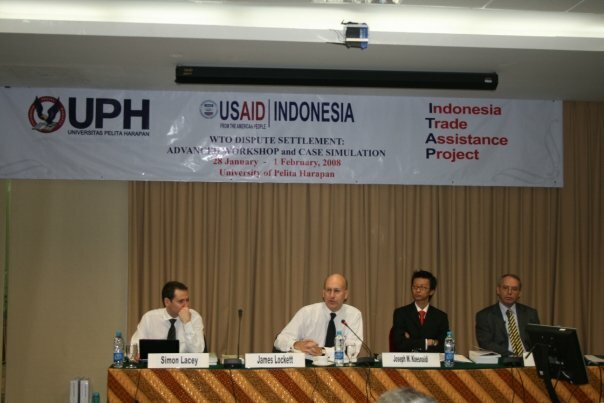 “WTO Dispute Settlement: Law and Practice”, USAID Legal Seminar Series, Jakarta, Indonesia. 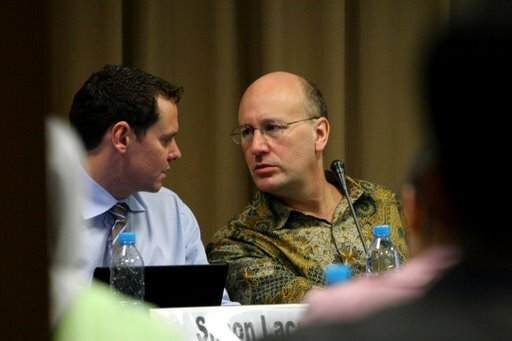 “WTO Anti-Dumping Agreement”, USAID Legal Seminar Series, Jakarta, Indonesia. 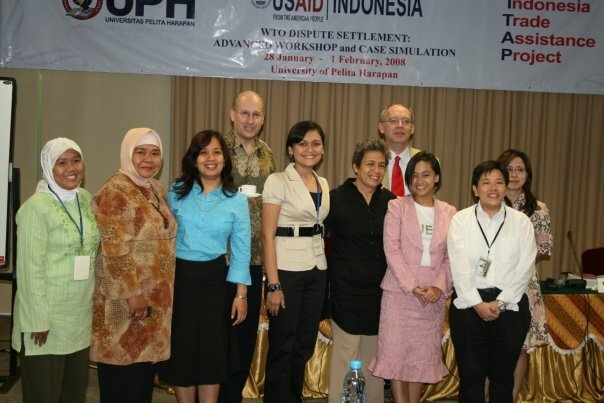 “Legal Aspects of the WTO Agreements”, USAID Legal Seminar Series, Jakarta, Indonesia. “Negotiating, Evaluating and Drafting Free Trade Agreements”, Ministry of Trade Law Seminar, Jakarta, Indonesia. “Strategies for Responding toU.S.and EU Unfair Trade Cases”, Ministry of Trade andIndonesiaChamber of Commerce (KADIN), Medan, Indonesia. “The WTO Doha Development Round: Status and Strategies”, Ministry of Trade Leadership Seminar, Jakarta, Indonesia. “Overview of the WTO: Law and Institutions”, Ministry of Trade Leadership Seminar, Jakarta, Indonesia. “Strategies for Responding toU.S.and EU Unfair Trade Cases”, Ministry of Trade andIndonesiaChamber of Commerce (KADIN), Semarang, Indonesia. “EU Trade Institutions and Policy”, Foreign Service Institute, U.S. Department of State, Washington, D.C.
“The Organization and Ethos of the European Union Trade Regime”, Foreign Service Institute, U.S. Department of State, Washington, D.C.
“European Anti-Trust Law”, Örebro University, Örebro, Sweden. “International Trade Law”, Örebro University, Örebro, Sweden. “Public Procurement in the European Union”, Stockholm University, Stockholm, Sweden. “The Trade and Customs Laws of the European Union”, Stockholm University, Stockholm, Sweden. “The European Institutions and EMU”,Örebro University, Örebro, Sweden. “Key US-EU Trade Issues”, in Conference on “Business Focuses onBrussels”, European Council of American Chambers of Commerce, Brussels, Belgium. “Challenges and Threats in a Changing World”, Conference on Visionary Leadership, Hope For Sweden, Jönköping, Sweden. “Cooperation Between European and Southern African Private Sectors”, Club de Bruxelles Conference on Investment and Trade In Southern Africa, Brussels, Belgium. “The GATT Uruguay Round and the New World Trade Organization: Key Developments”, The Conference Board Europe, Gothenburg, Sweden. “Key Aspects of International Business and Trade Law”,Örebro University, Örebro, Sweden. “Some Key Legal Aspects of Trading with the European Union: Recent Developments”, Conference on Economic Relations in a World in Transition: TheUnited States and the European Union, Thunderbird, The American Graduate School of International Management, USA. “The European Union Rules on Customs and Origin: Practical Aspects”, Conference on Swedish Accession, Stockholm, Sweden. “The Trade Laws of the European Union”, Conference on Swedish Accession, Stockholm, Sweden. “Public Procurement in the European Union”,Stockholm University, Stockholm, Sweden. “Trade and the Environment”, International Bar Association, Dublin, Ireland. “Public Procurement Remedies: The EFTA Surveillance Authority”, American Chamber of Commerce, Brussels, Belgium. “Accession to the European Union: GATT Tariff Implications”, American Electronics Association Europe, Brussels, Belgium. “Strategic Implications of the European Union after Maastricht”, ICCC Conference, Moscow, Russia. “Public Procurement in the EU: The GATT Government Procurement Agreement”, American Chamber of Commerce, Brussels, Belgium. “Practical Aspects of Exporting to the European Union: Changes in EU and GATT Customs and Trade Procedures”, Washington International Trade Association, Washington, DC. “A Post-Uruguay Round Update on US-EU Trade Relations”, U.S. Council for International Business, New York, NY. “Enlargement of the European Union: Implications For Sweden”, ICCC Conference, Gothenburg Sweden. “EC Anti-dumping Law and Procedure”, South African Foreign Trade Association, Johannesburg, South Africa. “European Union Perspectives on the GATT Uruguay Round”, Johannesburg Chamber of Commerce, Johannesburg, South Africa. “Immigration Law in the European Union”, Israeli Management Institute, TelAviv, Israel. “International Trade Law: Insights and Strategies for Management”, Erasmus University, Rotterdam, Holland. “Third Country Access to Procurement Contracts in the EC”, Korea Overseas Trade Association, Seoul, Korea. “Third Country Access to Procurement Contracts in the EC”, Keidanren, (Japanese Employers Federation), Tokyo, Japan. “Legal Aspects of Private Investment in Southern Africa”, Club de Bruxelles, Brussels, Belgium. “The Trade Laws of the European Community: Implications For Columbian Exporters”, ICCC Conference, Bogota, Columbia. “Distribution Agreements and European Law”, International Bar Association, Tel Aviv, Israel. “EC Anti-dumping Law and Procedure”, Manufacturers Association of Israel, Tel Aviv, Israel. 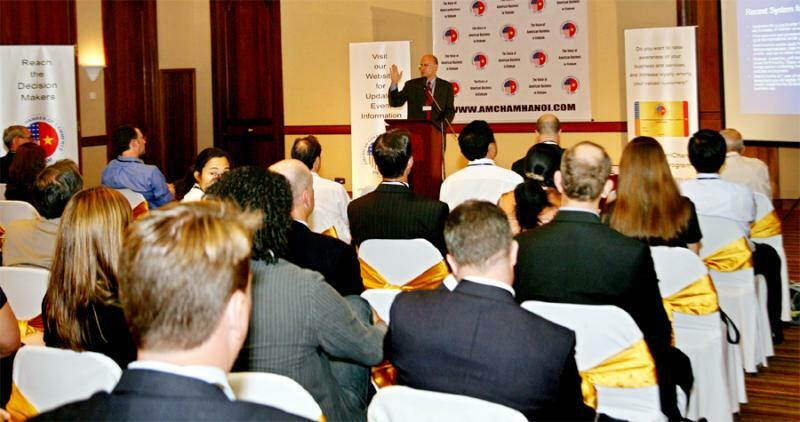 “EC-South Africa Trade Relations”, American Chamber of Commerce, Johannesburg, South Africa. “EC Anti-dumping Law and Procedure: RSA Application”, Department of Trade and Industry, R.S.A., Pretoria, South Africa. “Environmental Law in the European Community”, General Counsel Symposium, Minneapolis, MN, U.S.A.
“An Update on EC-US Trade Relations”, American Chamber of Commerce, Brussels, Belgium. “EC Anti-trust Law”, General Counsel Symposium, Minneapolis, MN, U.S.A.
“An Overview of EC Anti-dumping Law”, ABRAFE, Sao Paulo, Brazil. “EC Legislation and Programmes Affecting the Broadcast Industry”, European Religious Broadcasters, Altensteig, Germany. “Trading with the European Community”, ICCC Conference, Lomé, Togo. “The EC 1992 Single Market Programme: Strategic Responses for Korea”, Korea Overseas Trade Association, Seoul, Korea. “EC Anti-dumping Practice”, Electronics Industries Association of Korea, Seoul, Korea. “An Overview of the 1992 Programme: The Single Market and Its Opportunities for US Businesses”, First Bank, Minneapolis, MN, U.S.A.
“The 1992 Single Market Programme”, Pequiven, Caracas, Venezuela. “EC Anti-dumping Law: Recent Developments”, Korea Overseas Trade Association, Frankfurt, London and Paris. “1992 and the Single Market: Objectives of the 1992 Programme”, Korea Overseas Trade Association, Frankfurt, London, and Paris. “The Single European Act and 1992: Legal Consequences to Industry”, Commercial Department Conference, Lisbon, Portugal. “EC Anti-dumping Practice: Legal Aspects”, Korea Overseas Trade Association, Seoul, Korea. “Evolution of EC Trade Law”, Fair Trade Center, Tokyo, Japan. “EC Anti-dumping Law: Recent Developments”, Keidanren (Japan Employers Federation), Tokyo, Japan. “Update on EC Law Developments”, Seattle-King Country Bar Association, Seattle, WA, USA.